Visit the national monument or national park of your choice in California by checking out californiathroughmylens.com/california-national-parks-national-monuments/. To figure out where you want to go in the Sequoia National Forest, visit fs.usda.gov/sequoia/. My hands are shaking slightly as I tentatively try to take an iPhone panorama with one hand while hanging on tightly to my dog's leash in the other. My mind is telling me that maybe this wasn't the best choice, but I've adapted to ignoring that insistent little whisper. And the payoff is almost always worth it—at least that's what the trail guides I'd read said. If you can brave the granite steps, the view from the top is "breathtaking," an apt descriptor. SITTING ON TOP A surreal set of wooden steps take hikers from solid ground to suspended above a granite rock face looking out over the Sequoia National Forest. On July 8, I'm perched on a landing suspended above a gigantic granite rock face. 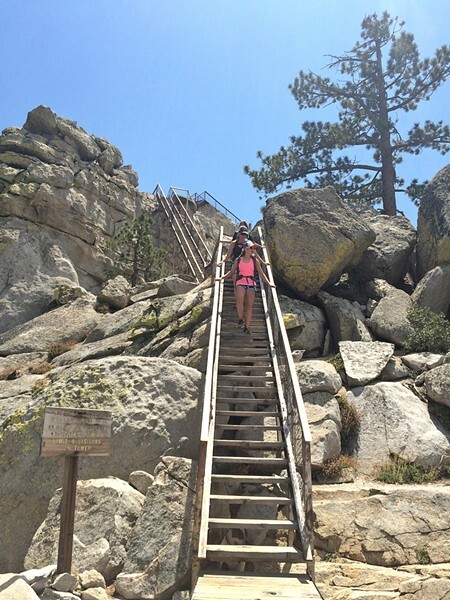 A 2.5-mile hike followed by a series of wooden stairs got me to where I am, at more than 8,200 feet above sea level and below the hanging staircase that once led into the Needles Lookout, a fire tower that ironically burned down in 2011. 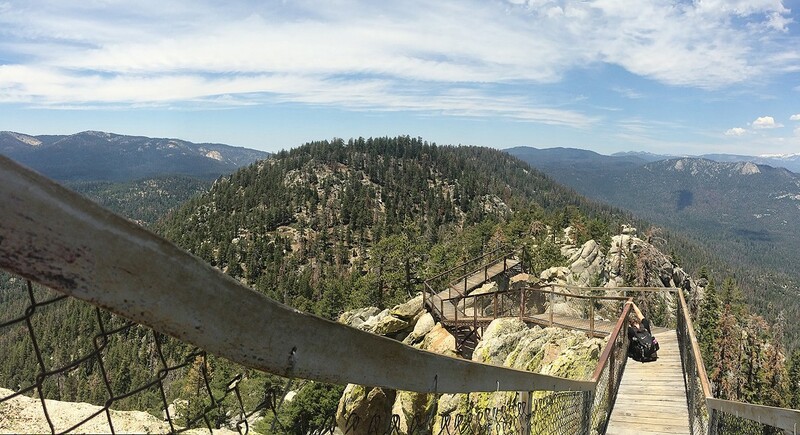 The stairs I'm on literally lead to nowhere but the oddly placed metal frame of a broken banister that looms ghostlike against the backdrop of the Sequoia National Forest. The trick to not freezing in terror, to be completely cliché and absolutely accurate, is to not look down and to not think. Simply enjoy the awe of accomplishment, place, and being surefooted. Because between the slatted steps is a lot of empty space that can only lead to one place, and I can see that place as I put each foot in front of the other. Only now that I'm writing about it am I getting a little dizzy at the thought of it. Back in that moment, I feel like I'm traversing a boardwalk above the world. A forest of sugar and ponderosa pines (many of which are dead and brown, thanks to the drought, a century of fire suppression, and bark beetles) stretches from the bottoms of my feet down into the valleys and back up the mountains on the other side. GOING DOWN A family of four walks down the stairs that lead up to Needles Lookout on the Giant Sequoia National Monument. Only four people are allowed up at a time, as the sign says. A helicopter circles above the Shaeffer Fire burning south of us on the other side of the Kern River. Back on the solid footing of land, the 100-degree heat hits me every time I venture out of the shade of conifer stands that line the trail, and all I can think about is going for a swim. And the creek we already put our tent next to is something my roommate and I are both looking forward to submerging ourselves in. This land is part of the 328,000-plus acres of Giant Sequoia National Monument, which is on President Donald Trump's list of national monuments under consideration for a change in federal protection level. July 10 was the last day to submit public comments on whether to delist or shrink its size. Former President Bill Clinton protected this particular swath of federal land under the Antiquities Act in April 2000, when he dedicated it while standing under a gigantic sequoia along the Trail of 100 Giants, a few miles from the Needles trailhead along the Western Divide Highway. 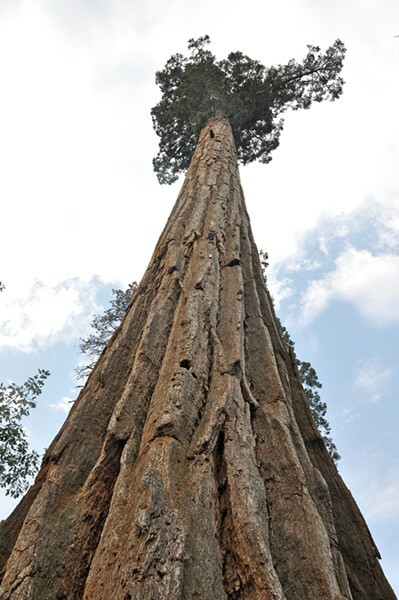 A GIANT Trying to view the top of one of the largest trees on the planet is a gander up 200-plus feet of giant sequoia bark along the Trail of 100 Giants. The grove of giant sequoias is one of 20 that are protected within the southern portion of the monument in the Western Divide Ranger District, and it holds 125 sequoias with bases larger than 10 feet across, according to the Forest Service. The larger trees are estimated to be between 500 and 1,500 years old. We walk the casual, paved, 1.3-mile loop July 9, on our way back to the "real world" of work, politics, and people. Editor Camillia Lanham gets dizzy when she thinks about national politics at clanham@newtimesslo.com.